Cummings Highway remains closed near the I-24 exit on Tuesday afternoon, Oct. 14, 2104, after heavy overnight rains caused localized flooding. One car was submerged at the end of the westbound exit ramp and was removed by wrecker. 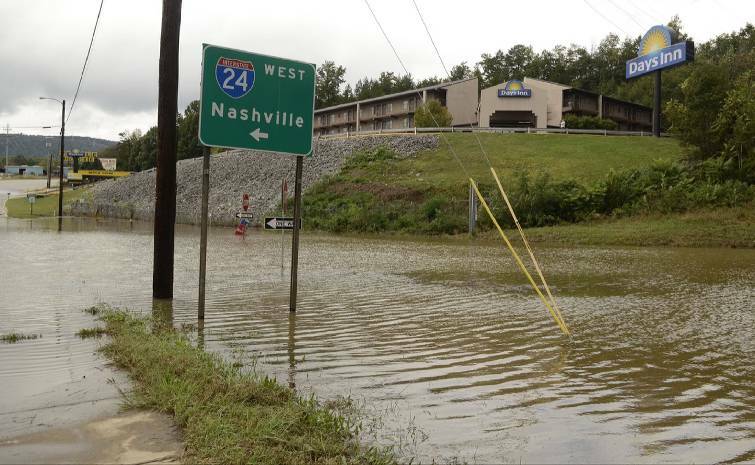 As anyone who travels west on Interstate 24 knows, even a small splash of rain is enough to flood the Cummings Highway exit at Lookout Valley, blocking access to homes, hotels, restaurants and Chattanooga Fire Station No. 3. So it's good news that work crews will begin Wednesday on a two-month project to solve the drainage problems at the exit. The Tennessee Department of Transportation said in a news release the $484,000 project will be done by Talley Construction Co. of Rossville. Plans call for it to be complete by Nov. 15. 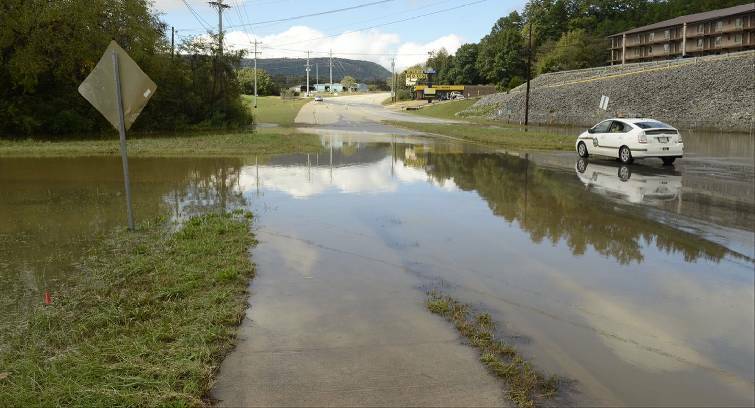 Chattanooga City Councilman Chip Henderson said that after back-to-back floods early this year, he worked with state Sen. Todd Gardenhire to see what TDOT could do about the perennial problem. There also was a public safety problem. Chattanooga Fire Station No. 3 is just uphill from the low-lying intersection and the frequent floods were "really slowing down response times," Henderson said. "I was getting multiple calls from people," he added. "It was affecting business, it was affecting our safety, it was affecting the residents there in their travel. It's going to be a much-anticipated and needed fix. We're just very excited the work's going to be getting started in the next few days." Water covers Cummings Highway at Interstate 24 after heavy rains in October 2014. 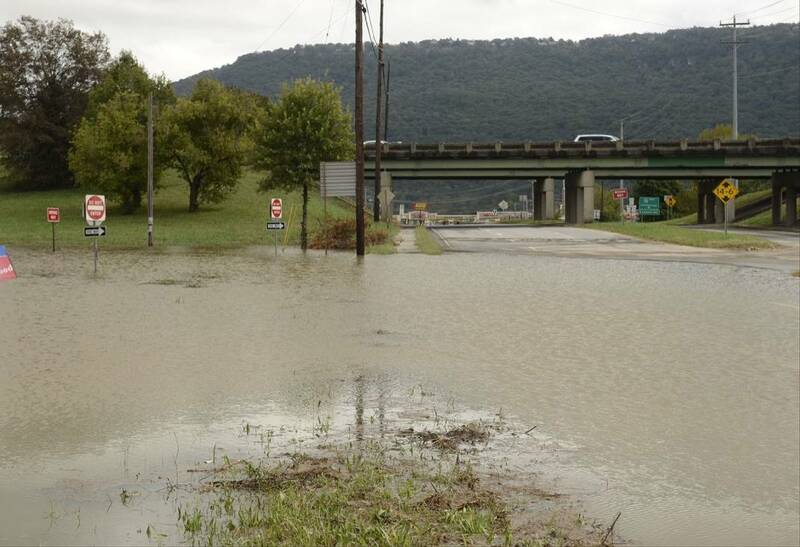 Workers will start Wednesday on a project to solve flooding problems at the exit. The project involves installing 24-inch pipes for drainage and constructing some detention ponds. That will require excavation on the interstate ramps as well as on Cummings Highway. The TDOT release said the contractor will work six days a week to get done as quickly as possible, and that at least one lane will remain open in each direction. The department asked that motorists be alert and drive with extra caution in the construction zone, being mindful of the crews working in the area. Caroline Ellins, associate manager at the nearby Cracker Barrel restaurant, welcomed the news Monday. "It's an issue for us," Ellins said. "When the exit is closed, we are very slow. It will help our business."